I think cooler weather jump starts my cooking/baking mojo too. When it’s hot, I can’t even THINK about blogging a recipe that requires stove or oven let alone make one. See here, I made this recipe a while back but could only bring myself to process the photos this week with the cool down. I got the idea to make this when Chuck and Hungry Bear posted their recipe for zha ziang mian last year. 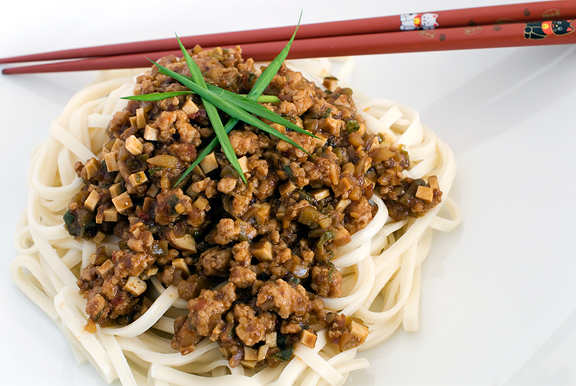 Zha ziang mian (or ja jian mien – my pin yin is non-existent as any of my Chinese friends know) is like Chinese spaghetti with meat sauce. My dad makes this dish on occasion and I had a mental note to ask for the recipe – an adventure in and of itself. My family does not cook from recipes, they cook by feel and memory. I cook by feel and memory too, but that’s not a particularly useful way to share recipes with others and it doesn’t lend itself well to photographing the process. It’s a bridging of two cultures, reconciling two very different (and sometimes opposing) ways of doing things. That is in essence the story of my life. Somehow, I have muddled along thus far, to everyone’s (including my own) astonishment. If the above ingredients are easy for you to find, have a cookie. If not, I included pictures of the mustard greens and dried tofu so you can identify these things in Asian grocery stores the way I do – by sight. You can use regular pasta with this, but that’s akin to using flour tortillas with mu shu pork. Kinda surreal and not quite right, you know? I prefer the Chinese flour stick noodles (see a picture of a brand of noodles I use). They are flour noodles. I call them flour stick noodles because that is how it gets translated on the packaging and we all know how fun and entertaining Chinglish can be! In the photo above, I have sweet red bean paste pictured. This is not what I was supposed to use (nor should you). My parents told me it should be a sweet bean paste – more like a sweet soy paste – that you can find in Asian grocery stores. They gave me a jar of it and then laughed at my mistake. Anyway, don’t use sweet red bean paste. My dad gave me two versions of this recipe. The first was off the top of his head, but I think he went back and made a batch in his kitchen because he sent me a revised recipe a few weeks later. Of course, my dad is the type of cook who can never reproduce a recipe because he’s always tweaking it to make it better, hence many states of the recipe exist. It’s like Schrödinger’s cat, by virtue of asking him to write down a recipe, it forces him to choose one of many states and then we wind up with one recipe from a suite of many potential recipes. Go review your quantum, kids. I love serving up a hot bowl of these fragrant, spicy, satisfyingly meaty (and yet tofu-y) noodles on a cold and rainy day. My friend M gave it the thumbs up – and she’s French! * This is NOT sweet red bean paste, but sweet bean paste which is really sweet soy bean paste that I was supposed to have used. This was most certainly lost in translation. If you look for the ingredient, it is a sweet soy bean paste which is actually not sweet and probably not a paste, but more like a sauce. Heat the vegetable oil in a large frying pan on high flame. 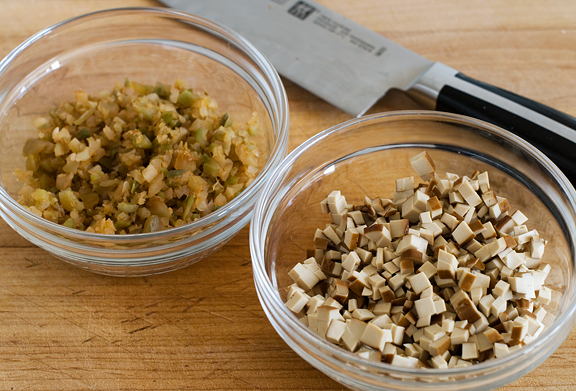 Add the garlic, ginger, and green onion to the hot oil and stir fry until fragrant. 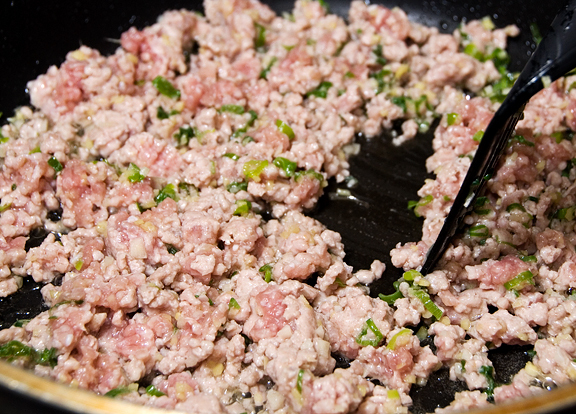 Add the ground pork and sauté until halfway cooked. 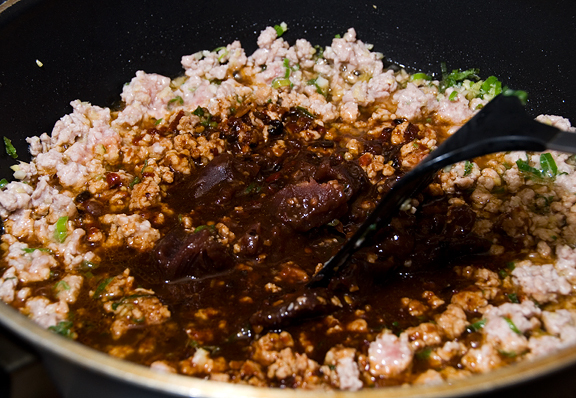 Pour in the cooking sherry, bean paste (optional), chili sauce, black bean sauce, and soy sauce and mix until the pork is cooked through. Add the mustard greens, tofu, and water. Stir and let simmer for a minute. Remove from heat and serve over hot noodles. The red bean paste is definitely an interesting ingredient in this dish! Your mis en place and knife skills are meticulous! Your cat chopsticks are nothing short of adorable! Thank you for all of the pictures. We do have a large ethnic grocery store here (half Asian half Latin American- it’s global ingredient chaos inside!) so I am very grateful for the ability to print out your pictures and bring them in with me. This sounds like a wonderful dish. That looks fantastic! I love the addition of the preserved mustard greens and tofu. Can’t wait to try this version! Mmm I had a version of this for dinner last night. I always end up adding some crunchy julienned cucumbers in as well. 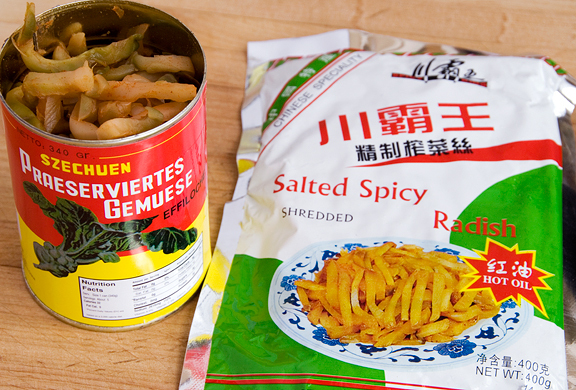 I think its called Zha Jiang Mien –so I suppose a combination of your two? Next time I might try adding some red bean paste and see how that goes. I love preserved greens (zha cai?) and eat that and porridge whenever I feel sick so I always stock up on those whenever I make a trip to the Asian market (which is a lot when I’m in SoCal!). This. looks. amazing. Ja jian mien (my pinyin is pretty non-existent as well) is my favorite noodle dish. It’s the noodle dish that I order at every restaurant without fail. When my mom makes it, she just mixes tian mien jian (sweet noodle sauce?) with sauteed edamame, diced dried tofu, diced chicken/pork. We don’t actually have recipes either, it’s more like one package of this plus one capful of that. But I will have to try this recipe soon. My mom would love the addition of sweet red bean paste, she usually eats it straight from the can. I love reading about what you’re cooking–you use ingredients that I never knew existed! I didn’t know there was such a thing as dried tofu or preserved greens! I am THIS close to moving in with you! Darn it all…I am a melting food. It’s 89 in the house right now at 1:50 in the afternoon, I fear what it will be by 7pm. So save me some Chinese spaghetti as it looks awesome!!! Oh my gosh, I absolutely LOVE zha ziang mien. At my house, my mom makes it with mung beans instead of radish–I’m going to try this version ASAP. Zha ziang mien made with fresh noodles mmmmm so comforting! Great recipe! So true about the Schrödinger’s cat reference! Ya gotta love anyone that can reference Schrodinger’s Cat in a recipe intro! You rule Jen! 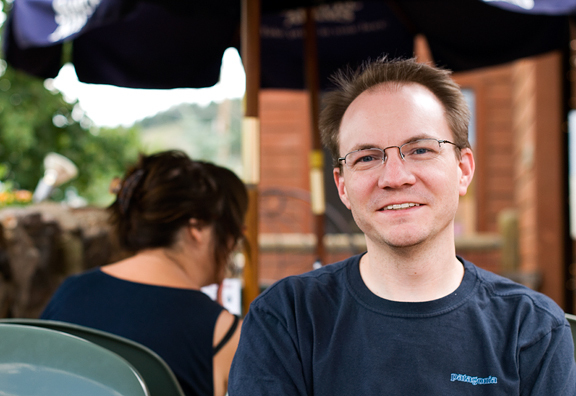 We’re in Boulder and I agree – the cool weather has been great! I took advantage of these last few days to actually work in the garden outside and cook in the kitchen inside. Both activities are slightly less enjoyable when its 90 degrees! Looks and sounds amazing Jen! I have been lurking on your site for many moons. I love it. I have only made one recipe, but I love that your carrot cake is the recipe I have been searching for for my entire cooking life. I made it, and didn’t even share with anyone. I froze some of it, and pull out a piece or two every now and then. I am in love. I just wanted to say thank you, and comment that your photography is beautiful, your site is awesome, and also state that the picture of the pork and vegetables that are starting to saute reminds me of cherry blossoms. Very beautiful. I love ja jang myun (well, the korean version I grew up with anyway). Thanks for sharing your version. I’m curious, what were you trying to accomplish with the sweet red bean paste? Just a sweet component or to help as the texture of the sauce or both? It would help me to decide whether or not to try and use it. Thanks! I love this and I didn’t even know it has a proper name! My good friend’s family has been making what we also refer to as Chinese Spaghetti (but with egg noodles) and we all love it and pester her to make it for us :) Saving your version pronto! The first time I had zha ziang mien, I totally loved it. Now every time we have shanghainese food this would be on our menu together with siau loong pau. Wish to order a bowl of this zha ziang mien from you, may I? Hmm, wouldn’t liang ban mian (err… cool mixed noodles???) be more appropriate for summer? i have to differ here – i am a sun-loving girl and enjoy every ray the summer offers! but i would still move in with you if i get meals like this! lol! I recently had something similar that had tiny little dried fish in it and have been craving it ever since. I love that you have pictures of the mystery ingredients! Looks delicious. ***Important Message *** :The sweet red bean pate is not one of the ingredients in this recipe. 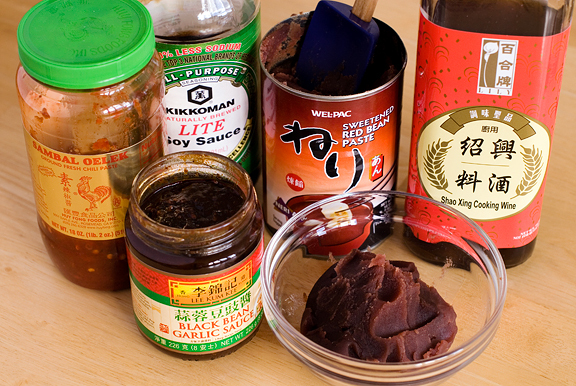 It is the Sweetened Soybean Paste that is in the sauce mixture (chile sauce, black bean sauce and this Sweetened Soybean Paste + soy sauce) that you need. The meat sauce can be stored in the frigi for a week. It is great if you want to add shreded cucumbers, carrots, etc. ooooh! i just had this last night! but not homemade and probably not quite as good as yours (although it def satisfied the craving). i’ll have to make yours soon. This looks delicious… I think we’ll have to try it here soon! My mouth is watering just looking at these pictures! Are preserved mustard greens the same as pickled mustard greens? Just curious. Thanks! Strike that last question – actually looked at the recipe! Thanks again! I think I can round all of these ingredients up in order to give this a try. I hope you will join me for Crock Pot Wednesdays. amazing jen! 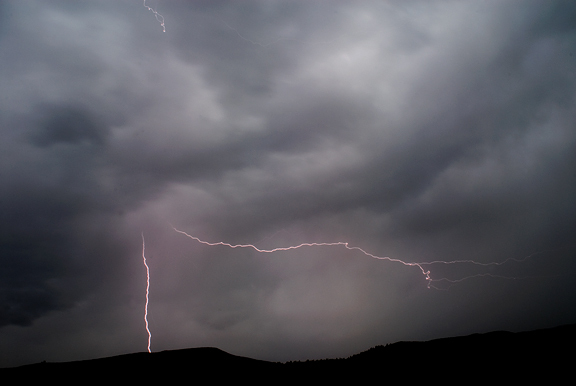 and that lightning….! Thanks Jen. Cheap, fobby restaurant thanks you too. Finished product looks gorgeous! Don’t think I could possibly stick a fork in that beautiful mountain of tastiness. Kinda want to ski down it, though. I have been meaning to try this ever since I saw someone order it at this tiny noodle house I used to go to. Being Cantonese, I’ve never run across it before that but damn did it look tasty! I think I’m going to try and make this sometime soon. *sigh* I guess I just have to go have a cookie. 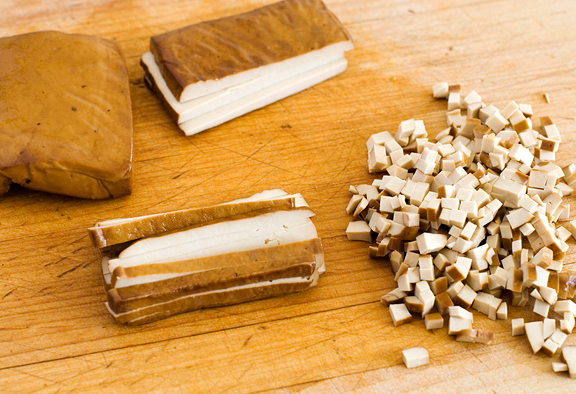 Pretty sure hell would freeze over before I could find dried tofu in Wisconsin. That picture of the fog rolling through though – probably my favorite weather. 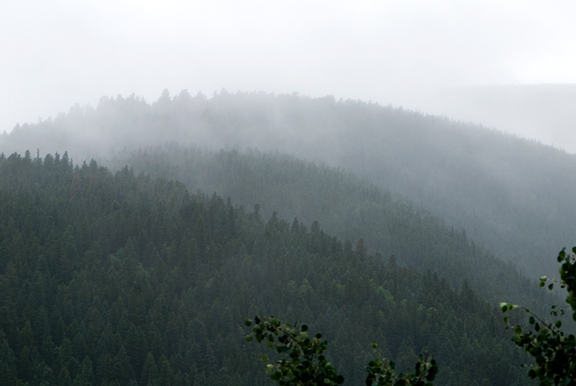 I love how misty everything feels. I’m laughing at your description of your Dad’s many versions of the recipe, because I have no less than five “recipes” of my favorite recipe from my Grandma! The first five times I made it with her, I carefully measured every ingredient before she puts it in the pot…and it’s totally different each time! I’ve given up, and at least I know the range of ingredients that possibly go in the pot – and I can recreate it close enough! Thank you for the pictures of the ingredients – the recipe looks wonderful and I might actually be able to find the ingredients now! Phoo-D – ha ha, thanks! Eesh – aww, you’re very sweet. Valerie – hee hee, I wonder?! That kinda comes full circle, doesn’t it? :) Quantum cuisine – that’s a great name! Sandra – great! Glad the baklava worked for you. The sweet red bean paste was a mistake, so I’ve corrected it with the proper ingredient (sweet soy bean paste which may be that noodle sauce you speak of?). TKW – baby, next time we get together we’ll take a little old trip down to the Asian market and show you what’s what. Margaret – oooh, mung beans sounds good too! Love all of the personal touches from everyone’s family recipes. Awesome! Audra – I love bamboo shoots and shitakes in just about anything, so that is a great addition. I will have to give that a try next time. Thanks! Katie – yes, I completely agree (I can’t think of many things I like to do when it’s 90 degrees). Tanya – that’s great! Welcome out of lurkdom and I’m really happy to hear that you found a recipe you liked (I love that carrot cake – LOVE IT). Thanks so much for your sweet comment. Susan – well, the funny thing is that it’s not supposed to be red bean paste. I found out from my folks that it’s supposed to be sweet SOY bean paste which is apparently not sweet at all, but that’s what it’s called. The whole translation from their memory into Chinese into their English translation into MY English interpretation messed that up. Anyway, it wasn’t bad with the sweet red bean paste, but I’m guessing it’s better with the sweet soy bean paste (which may be more of a sauce – I don’t know, I’ve never seen it before). Jo – mmmm. I love good xiao long bao! Ronine – isn’t it? It’s the brand I’ve been buying for like… twenty years! ha ha. Nora – yes, except 1) I’ve posted that already and 2) if you read my post you’d have realized it was near freezing here. Kristi – Preserved mustard greens are really salty. Pickled mustard greens are sour and usually include some of the leaves. You can find a picture of the pickled mustard greens here (for anyone curious to see what it looks like). Darnold23 – thanks! My crock pot doesn’t come out until October, but thank you for the invite. Caitlin – There *must* be a place to find it in Wisconsin. My cousin lives there… I’ll ask his wife if they know of a decent Asian grocer. Karen B – Yup, that sounds about right for a Chinese daughter trying to get a recipe! As usual, I applaud your consistency in dicing various ingredients into uniform sizes! It must be very fun growing up around your dad hehe! This looks so so yummy – why oh why am I unable to find most of the ingredients here in South Africa? I love the way this recipe is made out to baby steps….for people who can’t cook (me) it’s pefect…that being said it turned out excellent!!! :D Thanks! I have 2 little kids that won’t eat vegetables. Along with your recipe, I chop Asian squash the same size as the mustard greens and cook it within the sauce. They can’t tell the difference!!! I have been looking for this recipe for years. It was sold as tan tan noodle at a restaurant called Hui Bing Lo in San Francisco and I have not seen it anywhere since. Thanks! 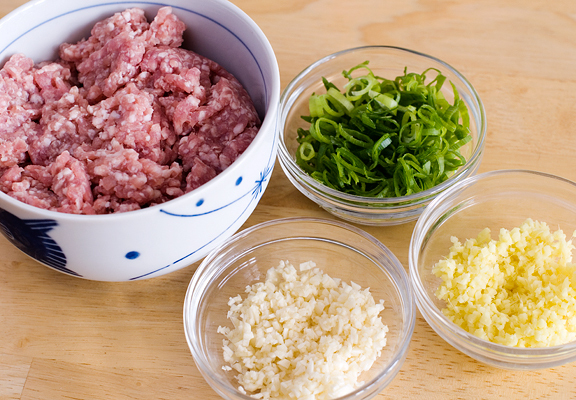 I made this recipe tonight with all the ingredients (except not adding any red bean or soy bean paste)…. and it came out sooooo salty :( I’ve made your recipes a million times before so I know its not you, haha. – just trying to figure out where I could have gone wrong! I had mostly the same ingredients (black bean sauce was the same brand) except I did use Lee Kum Kee soy sauce (not sure if this is saltier). I double checked the measurements and they were all right… is it supposed to be 2 tablespoons each of the black bean and soy sauce? As far as I can tell those are the only super salty things going in here. I can tell I’d love this recipe if I figure it out, so I’ll definitely try again. Thanks so much for the response! 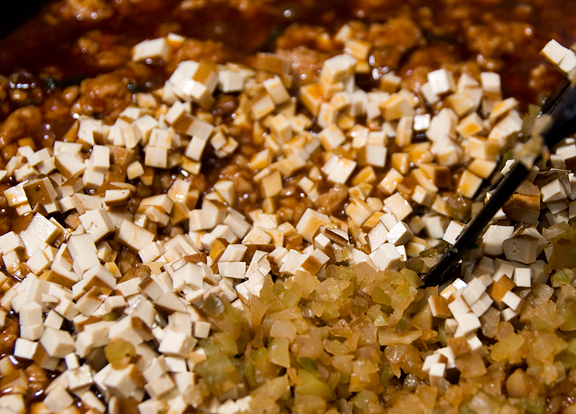 Yeah, I definitely love salty, this was salt-lick level though, even mixed with tons of noodles. Something must have gone wrong probably in what I bought/brand differences maybe… I noticed the sherry I bought has a really high sodium content, so maybe it is that. I will try again and be more careful with the soy sauce/troubleshoot!